Was the moon split into two parts at a certain time? I’m not sure what you’re referring to, but the current theory is that the Moon is the result of a collision with early Earth and a Mars-sized planetessimal. Early on when the earth was completely molten, the heavier elements (iron, etc) were falling to the center of the Earth leaving behind a less-dense outer layer/crust. When the collision happened, it ripped off that outer most layer and was flung out into orbit around Earth and eventually came together to form our Moon. This is the predominant theory behind why the Moon has an overall lower density than that of the Earth. So while it is not possible to “split” the Moon into two parts and reassemble it, it is the result of two bodies colliding with one another! I have a question concerning a comet that will pass by Earth in the year 2029. There has been speculation that the Earths gravity may alter its course and cause impact in the year 2036. Is this true? How is NASA tracking this, and what preparations are being made, if any. The object you are asking about is not a comet; it is a small near-Earth asteroid named Apophis. It will come very close to the Earth in April 2029, and the Earth’s gravity will dramatically alter its orbit. There is a tiny possibility (less than one chance in 40,000) that the asteroid could then be on an orbit that would hit the Earth in April 2036. In 2013 Apophis will be within range of the Arecibo radar, and that will produce a more accurate estimate of its orbit. I have discussed Apophis in several previous postings on this website, and you can also google it now that you know its name. Apophis is certainly interesting to scientists, and I just returned from an international meeting on defending the Earth against impacts, where we had considerable discussion of Apophis. I presented a paper there on a possible spacecraft mission to learn more about this asteroid. You can get lots more information on the NASA impact hazard website at (impact.arc.nasa.gov). Can’t it be possible that there is life even on moon but the life- forms there are biologically adapted to those conditions….in short, why are we always looking from our own frame,i.e. searching for water? The fundamental problem here is that we don’t always know what else is out there, how to look for it nor how to identify it. Until Antony van Leeuwenhoek’s work with the microscope in the late 1600′s, we (humans) had no idea that microbial life existed in the form of bacteria and archaea. Since then, we’ve broadened our horizons to discover that microbial life is actually the most abundant type of biomass on the Earth’s surface. It is entirely possible that other forms of life exist out there, but we have not yet learned to recognize them; but I, personally, eagerly await the time when we do! How is the general distribution of magnetic field of Moon? Is it strong at the poles or something? I have had a hard time finding an answer to this question. We have all learned that there is a “far” side of the moon due to the rotation and orbit being “the same”. This is even though parts of the far side can be seen at times. My question has always been, are the orbit and rotation really the “same”. I think of mountains that rise and fall compared to sea level maybe inches in hundreds or thousands of years. If not exact, is the moon slowly turning compared to the earth? 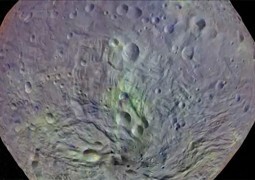 Could the far side of the moon become the close side in say 10 million years? Please satisfy my curiosity. While the moon is actually moving away from the Earth and the Earth’s tilt coupled to the Moon’s eccentricity in it’s orbit allows us to see more than just 50% of the moon’s surface, it is indeed locked into it’s current configuration forever and ever (barring any major catastrophe, e.g. a major impact). At the same time the Moon is moving away from the Earth, the Earth is also slowing down it’s rotation such that ultimately, it will be locked into having the same side of the Earth always facing the Moon as well. At that point, the Moon will rotate around the Earth at the same rate that the Earth rotates on its own axis. This transfer of energy happens through tidal friction and can be seen in other “tidal-locked” planetary bodies as well: for example Pluto and its largest moon Charon. According to Hurley and Pinson (1970) from the Proceedings of the Apollo 11 Lunar Science Conference V.2 pp 1311-1315, Rb was found present within Apollo 11 rock samples in the range of 1 ppm to 6 ppm. I live near Melbourne ustralia and was wondering about the polar orientation of the moon. Do we see the south pole on the top from our location? I get confused as most of the lunar maps show its orientaion differently. Some put South up. When I look at the moon is North ‘up or down’? For anyone living below the Earth’s Equator, the lunar north pole will be on the bottom half of the moon as you’re looking at it. It won’t necessarily be “down” from your perspective as that entirely is dependant upon your observing latitude here on Earth. Perhaps the easiest way to determine the lunar north from the south poles is to locate the Tycho Crater, which is an exceptionally bright (high albedo) crater and ejecta blanket which is located in the lunar southern highlands towards the south pole. So any time you see this bright crater, that is on the southern half of the Moon and a line drawn through the center of the moon and this crater will get you fairly close to the Lunar South Pole (~10 degrees off). Another way to orient yourself is to locate the darker regions of the lunar surface (the Mare) as *most* of this area is located in the northern hemisphere. Happy observing! Why didn’t astronomers know that asteroid DD45 was about to get so close to the Earth? Some suggested that it would have devastated a forest like the Siberian hit in 1908. I thought it was assumed that the possibility of an asteroid crashing was negligible. So why are some astronomers provoking the alert once again? What is the absorbed dose (rad/hr or gy/hr)rate on the lunar surface from Galactic cosmic rays and solar energetic particles during the solar minimum and maximum. Also were can I find this information in the literature/publications? Average solar radiation for spacecraft is ~0.3 Sv per year for solar mimimums and ~1.0 Sv per year for solar maximums. Keep in mind that these numbers are totaled for a whole year and the planetary body (the Moon) will shield them from radiation for ~1/2 of the year, so these numbers will be divided roughly in half. These numbers come from: L.W. Townsend, F.A. Cucinotta, and J.W. Wilson, 1992, “Interplanetary Crew Exposure Estimates for Galactic Cosmic Rays,” Radiation Research 129:48-52. The Lunar Reconnaissance Orbiter (LRO) is scheduled for launch in late-April 2009 and one of its primary missions is to study the lunar radiation environment, so you may want to keep tabs on its progress as well. Radiation during solar particle events can exceed several grays and will be deadly to humans if exposed to this radiation. For more on this effect, please review: J.L. Parsons and L.W. Townsend, 2000, “Interplanetary Crew Dose Rates for the August 1972 Solar Particle Event,” Radiation Research 153:729-733. What is truth behind the studies of the moon being hollow? Or atleast the common beliefs. I’m sorry to report that there is no scientific evidence in support of a hollow moon. This myth was originated by HG Wells’ 1901 book “The First Men in the Moon” and was perpetuated by subsequent literary works such as Edgar Rice Burroughs’ mid 1920’s books “The Moon Maid” and “The Moon Men” in which the Moon is hollow, supports an interior breathable atmosphere and is inhabited by a race of “moon men.” Unfortunately, ideas such as these found in fictional works of literature frequently make their way into the mainstream public eye and are mistaken for scientific fact. Some people may argue that the Moon’s lower overall density (~60% that of the Earth’s average density) and seismic ringing from a jettisoned portion of the Apollo 12 lunar lander indicate a hollow moon. However, the giant impact which formed the Moon (see a few posts down) stripped off the low-density upper crust of the Earth and is likely the cause of the low density. Additional seismic studies as well as moment of inertia calculations and gravity studies all reveal that the Moon has an interior similar to that of the Earth: (from out to in) crust, upper mantle, inner mantle, molten outer core and crystallized solid inner core. For additional “light” reading check out these scientific papers: Nakamura et al., (1973) “New Seismic Data on the State of the Deep Lunar Interior” Science. 181(4094): pp. 49-51 and Konopliv et al., (1998) “Improved Gravity Field of the Moon by Lunar Prospector” Science, 281(5382): pp 1476-1480. Do you believe that aliens exist ? I suppose I’m curious as to your definition of “aliens” and whether you include all life (as we know it) or just “intelligent” life. But between research by SETI, analysis of Martian meteorites, recent findings of methane within the Mars atmosphere and other similar studies, there is no current evidence for life elsewhere, intelligent or otherwise. What path would you recommend to undergraduate students looking to study lunar or planetary science? Is a degree in astronomy preferable to a degree in geology? Are there graduate programs with particularly well thought of planetary science programs? Are there programs where grads or undergrads can get there foot in the door? The Short Answer: most any scientific discipline. The Long Answer: Planetary science covers almost all scientific disciplines: biology, geology, astrophysics, astronomy, engineering, physics, etc, etc, etc. The best thing for you to do is pick an area that gets you excited personally, and put a planetary spin on it. Personally, I chose microbiology and studied the way microbes are able to metabolize minerals and rocks. This easily ports over to an astrobiology/planetary topic of enlarging the known environments and conditions under which life could potentially exist (subsurface Mars and Europa ultramafics for example). My recommendation is to continually work on outside activities that demonstrate your passion for planetary science/space/etc and make sure to highlight those activities on your resume/CV. There are several planetary/lunar programs out there. Take a look at current literature, specifically projects that you find interesting, and see what institutions are conducting current planetary research in which you’re interested. For purely selfish reasons, I’ll plug the new teams that were just selected for the NASA Lunar Science Institute (NLSI): Brown, U. Colorado – Boulder, Johns Hopkins. All of these schools are creating new planetary/lunar courses and buffing up their grad/undergrad programs in total. Of course, there are lots of other schools out there, so take a look around. Several programs exist for undergrads/grads to get started in this field. One I might suggest is the NASA Academy for Exploration (http://academy.nasa.gov). The NASA Undergraduate Student Research Program is another. The Lunar and Planetary Institute also has a summer program with info about this and other opportunities on their website. Each of the teams of NLSI has an undergrad/grad training program underway as well. Emails to current and former members of each of the above should bring out additional opportunities tailored to what you hope to accomplish. Good luck! Is the “Giant Impact hypothesis” still considered to be the best explanation for how the moon came into being? Yes. The current experiments and modeling efforts predominantly use the giant impact hypothesis as the basis for their studies. In other words, approximately 4.5 billion years ago, a collision of the early Earth with a Mars-sized object resulted in the formation of the Earth/Moon system. This model provides answers to the reasons behind the Earth/Moon high-spin system, the low density of the moon, and lunar composition. Other hypotheses on lunar formation are that a planetoid (the Moon) was captured in the Earth’s gravity well, or that the Earth and Moon co-formed together through accretion. Neither of these explanations provide quite the full picture that the giant impact does, however. Almost all the photos you see of the astronauts on the Moon are “original filming”. The live video that was broadcast to Earth at the time was quite limited; in the case of Apollo 11 it was difficult even to see what was happening. By the later missions the astronauts were using color video, but even that was low resolution by modern standards, reflecting limited bandwidth communications. However, the astronauts brought back excellent film stills taken with Hasselblad cameras as well as 16mm movies. These were the products used to make the contemporary NASA releases, and they are what we see today in more recent videos about Apollo and the exploration of the Moon. The originals of all the films are kept at NASA Johnson Space Center in Houston. Why have a space station in orbit when observations can also be made from the surface of the Moon or why not have a Moon base in conjunction with a orbiting station? It is the suspicion of some that your agency has deliberately avoided the Moon for reasons the public in generally unaware of. I have lost my respect for NASA over the years because of the deliberate cover-up that is being exhibited and perpetuated. I suppose the fear is that the public cannot deal with the truth, which I can’t say I disagree with. Was streptococcus actually found in Surveyor 3 after spending 2 and a half years on the Moon or is that just a rumor? If humans colonize the moon, given the different enviromental conditions and population isolation, would we likely evolve into a different species over time? Would it be possible to set up a sterling engine at the light/dark terminus on the moon? Is there enough difference in temperature to make this feasible? if the moon moves out of earths orbit what would happen? Does the moons magnetism affect earth life so much that we can’t survive without it. If this is not true that armstrong saw alien base camps on moon then Why not nasa plans for a base station at moon and there have been no moon missions for the past 20 years or so? my first question is that after neil armstrong did any other missionaries were sent to moon?? secondly what about the fact that there are aliens on moon on the other side as mentioned by neil armstrong that they saw alein base camp?? how far its true?? Have we ever put people back on the moon since Apollo? I was just curious if there were plans to ever go back. Never hear anything about it. ected Sir/madam, Can u pls tell why NASA had stopped the Moon Mission after 1972?? If a moon base were to be built, what would it use as a source of oxygen and water? I’m not sure if someone already asked this question, but, who has been on the moon? I mean, what are the names of the people who have been on the moon? Are there any places (Luna, Mercury, etc.) in the Solar system which we can be certain, beyond reasonable doubt, do not contain life? If so, what is the reasoning behind sterilization of probes and landers in these areas? Isn’t it our prerogative and obligation to attempt to introduce extremophiles to such environments for research purposes and to gain actual experience in terraforming, which many view as inevitable & necessary? why does nasa not use electricity and the rail system to launch equipment from earth into space and beyond? I want to work with NASA. Presently I an in eleventh class in India. Give me information about NASA Exam. There are several companies that claim to sell real estate on the moon. Do any of these have any legal validity? Has there been a test case where one of these companies has been taken to court for obtaining money by deception? I thought the moon had legal status similar to antartica? Apologies if you have been asked before, but — Surely there is a telescope on earth that can see evidence of the moon missions and therefore put to bed any suspicion that man has not been there? Astronomical observation from moon surface vis-a-vis low earth orbiting observatory? Which one is better for Astrobiology study? Do you think human beings will ever be able to live on other planets? It is known that human, animal and plant physiology has been shaped by gravity. What are the potential risks for human beings of prolonged stay in outer space or on other planets or bodies with different gravity fields such as the Moon or Mars? If human colonies were to be on extraterrestrial bodies for a long periods, how could their physiologies conceivably develop or differ from staying on Earth? Finally, what do we know about how animals and plants develop in extraterrestrial environments? Why can we not see the backside of the moon from Earth? I was reading about 581 c, and have a question regarding the theory that the newly discovered planet possibly may NOT rotate, meaning one side of the planet it always light and the other side is always dark. I guess I assumed that all planets rotate… but sometimes in opposite directions (like Earth and Venus, I think?) Are there any planets in our own solar system that don’t rotate? If the moon is colonized by the united states within the century, is it a possiblity that the moon will become a privince/state/ of America. I just saw the excellent film Cosmic Collisions at the Rose Center in NYC with my 14 year old. The film does a wonderful job of explaining how the moon formed from the earth. But it raised this question I couldn’t answer: Why do we think the Moon didn’t form an atmosphere and some form of life but Earth did given that the Moon was cosmically next door to the Earth? Why is it that the government and NASA both continue to ignore the almost certainty of intelligent life throughout all of space? For man to believe that he is the only intelligent life is naive and ignorant. Even if all reports of ufos and extra-terrestrial contact are false, it still does not make logical sense to believe that man is alone. After reading this short arguement, which you have almost undoubtedly read or even pondered yourself, is there not the distinct possibility and probability of life? My wife and I was watching a TV program about the first Moon landing. We were wondering, with all the new and advanced technology why hasn’t NASA went back to the Moon. Has anyone in NASA or on a space mission ever seen a UFO in space, on the moon or on earth? Why hasn’t anyone gone back to the moon since the last moon landing? I was wondering if we have ways of measuring the age of planets. If so, do we know which planets are oldest and which are youngest? I know that it’s true that Apollo 11 did spot a UFO… Is it true that other hams could pick up the television broadcast that was shut down durring the spotting of the UFOs? If so is it true that the hams could pick up Apollo11 saying that other spacecraft were spotted on the crater edge of the moon and were much more advanced than Apollo11′s technology? What would happen to the earth if the moon were destroyed? Has the moon been moving away from planet earth from the beginning? Also, does it keep moving away faster or has the rate always been about the same? Are there any Earth like mountains on the Moon, or are all the raised features the result of impacts? There seem to be tests that can determine the age and origin of rocks, that have been used to identify meteorites and test the age of the moon. Can these tests be applied to refined materials, such that if you ever did find an alien artifact, it would be possible to identify it as not coming from Earth? Edwin Aldrin recently came out on in a special on the Science Channel and stated that the astronauts aboard Apollo 11 all saw unidentified objects which seemed to have been following them. He also mentions that they were briefed not to talk about what they had seen. What does NASA have to say in response to this? What were those objects they all saw? I read Apollo 12 returned with a camera from a moon probe which apparently carried S. mitis to the moon, survived under those conditions, and was viable after returning to earth. How did NASA/CDC decide the S. mitis was not a lab contaminant? I am debating my friend on whether man has walked on the moon. She says that only one man has walked on the moon, but i believe this to be incorrect, do you have a list of people that have walked on the surface of the moon?